Get the latest Distinct Poplar story! Once there was this very filthy woman, who lived in a very filthy apartment, in a very filthy building, at the very end of the filthiest street you’d ever seen. I lived there as well with my Dad, but I was the cleanest one—I swear! 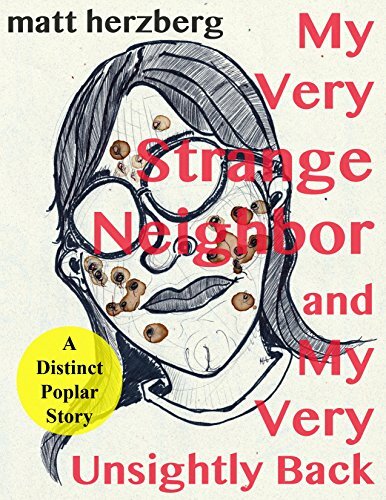 She was my very strange, and very dirty neighbor, this very filthy woman I mean. She was that special kind of messy. The kind that seemingly produced it’s own disgusting film or glaze. A gravy-like stuff that got stuck on your skin whenever she touched you. The kind of grime that one wears, like a second set of goose pimples, which stinks of old earwax and burnt hair soaked in urine or something. Which I discovered on the very first day we moved in, because she lived right above us. She made sure to introduce herself by insisting we shake hands, that’s how it happened. Her stench, her slime, it was like something died. It seemed to just keep and it kept quite a bit. No matter how many times I washed my hands, I just couldn’t get that disgusting stuff off. And I wash my hands a lot. Just saying so is all. Her name was Keenie Mee Keelie, and when we first met, I thought that it was birthmarks…the crap on her face. She looked like a rat wrangler, if you can picture such a thing. Her hair was like a nest, and she always seemed to have, well… crap on her face. Or at least what looked like crap to me, and my eyes were as good as any. Sure, It could have been raisins or melted licorice candy, or mud I suppose. But to me it seemed like there were creatures living in her hair. Filthy creatures, and they must be using her face as a toilet when she wasn't paying attention. Which must have been routine because how else does one explain that kind of a mess? Every time we ran into each other there after, I swear that whatever it was, that globby, puffy, dribble... was moving. Not floating, not inching, or smearing or dripping. It was like suddenly noticing that the crap on her face had moved when I wasn't looking, but only slightly. One would really never know unless they were paying close attention. I couldn't get it out of my head for days, so I couldn’t stop watching. Slowly creeping crap, crap on her face! Also, she always dressed disheveled and mussed. Wearing old worn out and faded clothing, and sporting a pair of large glasses that took up way too much of her face. She always seemed to look as if she had just climbed out of a dumpster. And maybe that’s where she found them, the creatures that must be living in her hair. The creatures that must be micturating down her neck and defecating across her cheeks as she slept. So much and so often that she could never get clean. Not even if she were to shower twenty-four seven. Which is what I thought she was always doing anyways because she was always singing up there. Singing like she was always taking a shower. I assure you however, that she most certainly never gained ground on her struggle with cleanliness. Her tunes always sounded like they came from the bathroom. Bouncing from tiled floors and walls, and then bounding down into the pipes somehow. And all I could hear was this shrill, nasally chanting, shrieking, and screeching. Not something pleasant. Not something you could actually enjoy listening to. And it just seemed to happen whenever I turned on the faucets. The sound would increase and decrease as I twisted those old spiral heads from left to right. My Dad said that it was “just old pipes”, but I knew better. Better because I could hear it coming from directly above me. Besides my Dad was never around, always at work or out late doing who-knows-what, so he wouldn’t know for sure anyway. This was my very strange neighbor by the way, in which I am currently speaking of. The one I would eventually rely upon for help, if you can believe it. That one strange, filthy chick, the one with the crap on her face. Anyways, it was my unsightly back that just wouldn't quit, that was the means that brought us together. That’s right, my unsightly lower back, which just seemed to stretch on forever somehow. A real emergency if you ask me, and it had to be dealt with and quickly! The problem was that it just wouldn’t quit. My back had twisted and stretched and elongated, albeit slowly and when I wasn't paying attention. I am not sure how it happened exactly. One day it seemed like, whenever I looked over my shoulder, that my back didn’t come to a full and honest completion. If I tried to turn quickly, while examining myself in the mirror, it seemed as though it took a little bit longer for my bottom to catch up to my top. It was as if it, my unsightly back, had grown a mound of extra flesh. It felt like spare cartilage, fat, and muscle had formed. Perhaps some pus as well, to give it just the right jiggle when I attempted to poke it aplenty. With the dull head of a dried up ball point pen, I gave it a solemn and honest near scientific test. A series of pokes, a regiment of jabs, and even a couple of squirming pinches with the help of two fingers. In bed, I swear I was partially raised and practically hovering. Propped up as if there might be an extra pillow caught underneath me. Or that my clothes felt like there was a bunch or a knot. A wad of flesh that grew innocuously at first without my notice. Until it got so big that it couldn’t be missed, staring back at me in the mirror while I was engaged deeply in my routine morning inspection. Don’t Feed The Doolgeeze (Lest They Feed You)!